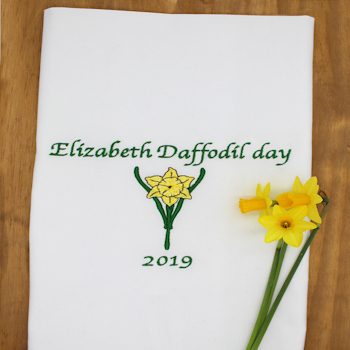 Daffodil flower motif tea towel that can be personalised with an embroidered name or little message of your choice. Daffodil flower motif tea towel that can be personalised with an embroidered name or little message of your choice. A lovely gift that is ideal for birthdays, mothering sunday, Easter, St Davids day, anniversaries. Cotton tea towel hemmed on all sides embroidered with a beautiful spring time yellow daffodil flower and the words in your choice of thread colour. Personalised gifts are specially made to order by Amys Gifts, please allow at least 24 hours for dispatch.